The fourth novel in Kate Emerson’s well-reviewed series set in Tudor England—based on a real life member of the royal court of Henry VIII. 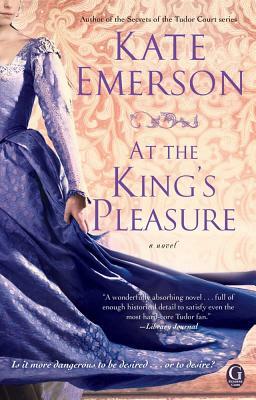 Following the acclaimed By Royal Decree, Pleasure Palace, and Between Two Queens, Kate Emerson again plucks a real figure from history in this lushly detailed tale featuring Lady Anne Stafford—who is torn between her husband and another man. History remembers Lady Anne Stafford as the woman who cheated on her husband with both King Henry VIII and his companion, Sir William Compton. Lady Anne was indeed in love with two men at the same time….but the king wasn’t one of them. Lady Anne’s complex and heart-wrenching romantic relationships are at the core of this riveting tale that masterfully blends romance, drama, and historical detail as only Kate Emerson can. Kate Emerson was born in Liberty, New York, and attended Bates College and Old Dominion University. She currently lives in Wilton, Maine. She is a member of the Historical Novel Society, the Mystery Writers of America, Sisters in Crime, and other professional organizations. Emerson also writes a Scottish mysteries series as Kaitlyn Dunnett. She currently lives in rural Western Maine with her husband and three cats. Visit her at KathyLynnEmerson.com.